The emergence of resistance to conventional antimicrobials is a serious problem that physicians face. This necessitates constant development of newer agents, which can inhibit the growth of or kill resistant organisms. Eucalyptus is a tall, evergreen tree, native to Australia and Tasmania, successfully introduced worldwide, now extensively cultivated in many other countries including India.,,, The genus name Eucalyptus comes from the Greek word eucalyptos, meaning "well-covered," and refers to its flowers that, in bud, are covered with a cup-like membrane. Though native to Australia, its therapeutic uses have been introduced and integrated into traditional medicine systems, including Chinese, Indian Ayurvedic, and Greco-European. Its volatile oil is obtained by steam distillation and rectification from the fresh leaves or the fresh terminal branches. Eucalyptol (1, 8-cineole) is the active ingredient of the eucalyptus oil, responsible for its various pharmacological actions. Pharmacopoeial grade dried eucalyptus leaf must contain at least 2.0% (v/m) volatile oil, composed mainly of 1, 8-cineole. 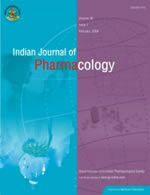 The Indian Pharmacopoeia requires not less than 60% w/w of cineole. Oil of eucalyptus has been traditionally used in Ayurveda as an antiseptic and for respiratory tract infections. Moreover, Nadkarni has reported its antibacterial action. However, much scientific data is still not available regarding its antibacterial action. Oil of eucalyptus (containing 63% of eucalyptol) was obtained from the local market and used for the study. Organisms were isolated from the pus samples of patients from the surgery department. The organisms (isolated and identified by standard methods) were Klebsiella spp., Proteus spp., Pseudomonas spp., E. coli, and S. aureus. Only those organisms resistant to conventional antimicrobials (tobramycin, gentamicin, amikacin, ciprofloxacin, chloramphenicol and cefotaxime) were used for the study. The resistance of the isolate to the conventional antimicrobials was confirmed using disc diffusion as well as MIC testing. The sample size for each organism was twenty five. The samples were inoculated on Mac Conkey and Blood agar and incubated at 37°C for 24 h. Three to four colonies of organisms from the culture media were inoculated into 4 ml nutrient broth and incubated for 2 h at 37°C. The inoculum was standardized by matching its turbidity with Mc Farland no. 0.5 standard. With a sterile cotton swab the test culture was spread evenly on the surface of a petri dish containing solidified Mueller-Hinton (M.H.) agar (pH 7.2 to 7.4). Five wells were made in the M.H agar plate using a sterile cork borer (0.5 cm). Different doses of oil of eucalyptus, i.e., 5, 10, 25, 50, 100, 150 and 200 micro liters were poured in the wells with the help of a sterile micropipette. The plates were incubated at 37°C for 24 h and at the end of 24 h the diameter of the resulting zone of inhibition was measured and the average values were recorded. The data show that, E. coli and Klebsiella spp. were sensitive to 5 ml; S. aureus to 25 ml while Pseudomonas and Proteus spp. required 50 ml of eucalyptus oil [Table - 1]. 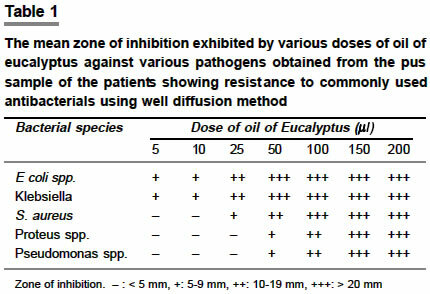 With an increasing dose of oil of eucalyptus, the resulting diameter of the zone of inhibition increased for all the organisms. The results of the study revealed that oil of eucalyptus has antibacterial activity against Gram-positive as well as Gram-negative bacteria resistant to commonly used antimicrobial agents. However, toxicological data on the systemic use of eucalyptus oil are lacking. Currently, it is focused towards local use as an antiseptic. A study done by Sherry et al reveals that topical application of eucalyptus oil is effective against methicillin resistant S. aureus infection. Moreover, Kumar and Ahmad also report the antibacterial action of oil of eucalyptus on local application. However, further studies are still required regarding its effectiveness in the presence of pus and its safety report when applied on infected skin or mucous membrane. The author is very thankful to Ms. Nishita and Dr. M. B. Shah, Head, Department of Microbiology for their help and cooperation.